Never has this been a truer statement than at Christmas time. Hundreds of people, from the very young to the not-so-young, lined Clothier and Prescott Streets to wait for the most popular figure in holiday mythology (not the Town Crier). 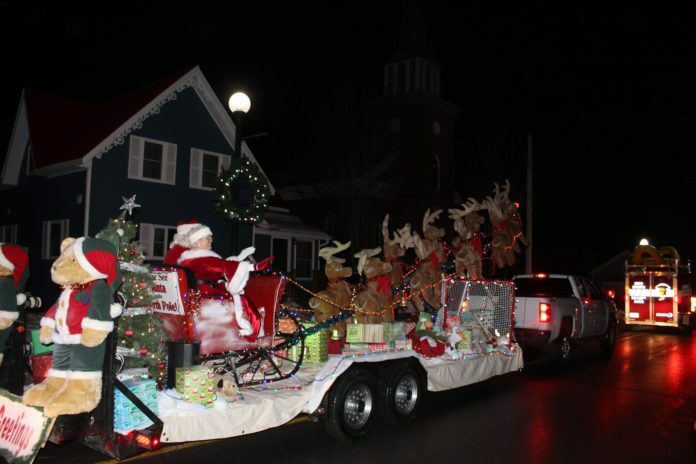 This year’s parade moved from the traditional mid-afternoon time slot to the late afternoon and early evening. The parade started off at the Kemptville Campus and wound its way down Concession Road, turned left on to Prescott Street, and then eventually turned left on Clothier Street, where it finally broke up at Holy Cross Church. People watching the parade lined almost the entire length of the route to celebrate the festive season. In the past, people seemed to congregate more in the Downtown Core, but now seem to be spreading out in order to get a better view (and they’re setting up lawn chairs). 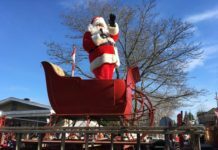 Your TV (Cogeco) out of Smiths Falls was on hand for the festivities and recorded the parade, which will be aired at a later date on Your TV’s local cable community channel. 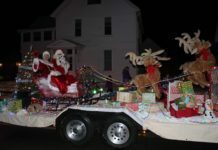 Kathy Botham was doing the play-by-play for the camera as each float rolled by at the corner of Prescott and Clothier Streets. The floats themselves seemed to be ready for the new darker start time, as many of them were well lit. Even many of the walking participants had glow-in-the-dark items on, or had adorned themselves with Christmas lights. The only exception seemed to be the Town Crier, courtesy of the NG Times. But, though you might not have seen him, you certainly heard him and his bell. Initially, there was widespread fear that rain might put a damper on things; but the rain held off, for the most part, and everything seemed to go smoothly. There was no need for rain gear, or even cold weather gear for that matter, as temperatures stayed above freezing for the duration. I’m sure that Mr. and Mrs. Claus didn’t mind the milder weather, as they’ll be experiencing the cold and wintry weather soon enough at the North Pole. A warm and hearty “thank you” needs to go out to all the sponsors, volunteers, and especially the Kinsmen for organizing this year. 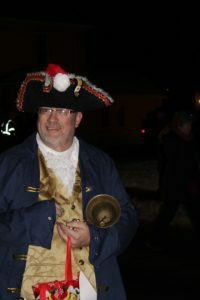 Having the parade at night seemed to be popular with a number of the onlookers who expressed an opinion. Judging by the number of people lining the sidewalks, this year’s parade appeared to be very well attended. Besides, we all know that Santa does his best work at night!